Did Pierre-Edouard Bellemare bite P.K. Subban's finger? 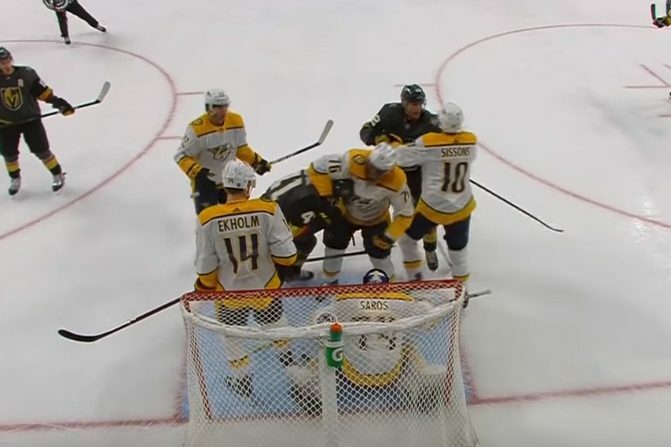 There was a bizarre incident during Wednesday’s game between the Nashville Predators and the Vegas Golden Knights. During a scrum in front of Nashville’s goal, P.K. Subban claims that Pierre-Edouard Bellemare bit his finger. Bellemare claims that Subban’s fingers went into his mouth while trying to pull him out of the crease. It’s difficult to tell with any certainty what’s happening here. Subban clearly grabs Bellemare in the face. From there, it’s anyone’s guess whether there was an actual bite or incidental contact. The small drops of blood on Subban’s jersey suggest whatever happened broke the skin, making a bite seem likely. Subban’s reaction certainly suggests a bite occurred, but that’s not the most reliable evidence given his record of embellishment in the NHL. For what it’s worth, Bellemare wasn’t penalized on the play and is sticking with his story that he didn’t bite down. We may never know what really happened in this Subban-Bellemare biting controversy. What we do know is the NHL has delivered far too many mouth-related stories over the last couple years. At least this one doesn’t involve Brad Marchand licking someone.